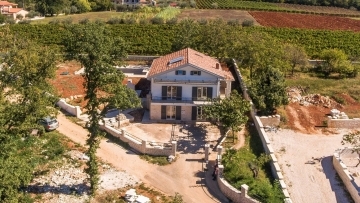 Beautiful Istrian villa with a swimming pool and sea view. Four bedrooms and 4 bathrooms. Excellent quality, some ceramics is installed in the bathroom and all other materials are of top quality, made of stone and wood and mostly handmade. On the ground floor there is a living room with a kitchen and a bedroom with a bathroom as well as a large storage space, on the first floor there are three bedrooms and three bathrooms. It's sold fully furnished.